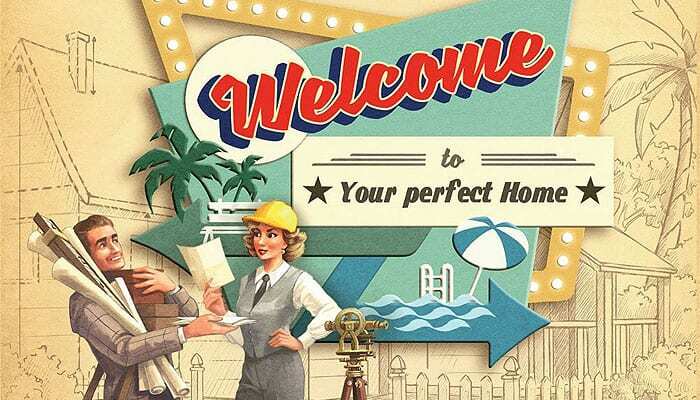 In Welcome To, players are American architects in the 50s during the Baby Boom. But beware of the competition! Who will best accomplish the city's plans by creating the nicest housing estates in the three streets they've been assigned? Will your luxurious parks and fancy pools be enough to earn you title of Best Architect? Welcome To is a game where everyone plays at the same time with the same cards. It's all about cleverly combining the house numbers with their associated effects in order to become the greatest architect of tomorrow ! 18 City Plans for the basic game & 10 City Plans for the advanced variant (marked by a ). One Solo card included for the solo variant. Cards numbered 1, 2, or 3 with a Project side & an Approved side. Architects gradually develop their three streets by building houses, identified by their numbers. Houses will be grouped into housing estates, but only fully-completed ones count at the end of the game. Parks and pools help to improve the neighborhood. Architects can raise the quality of their constructions in order to promote their estates' value. All of this while trying to be the first to complete the City Plans! Finally, by increasing recruitment through temp agencies, architects can hasten the construction and get in the mayor's good graces. Each player takes a pen or pencil (not provided) and a sheet from the player sheet. y Distribute the Player Aids to the players. Shuffle and randomly choose 3 City Plan cards from the basic set: one n°1, one n°2, and one n°3. Place them " Project " side face up so all players may see. Return all remaining City Plans to the box. Shuffle the Construction cards. Deal 3 equal stacks of 27 each, house number face up. Place these in a column with room for discards to their right. 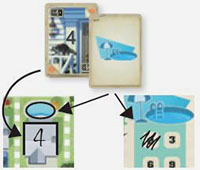 At the beginning of each turn, flip over the top card of each construction stack and place it to the right with its effect displayed. These stacks create three combinations, comprised of a House Number and an Effect. These combinations are used to perform actions. Players take turns simultaneously. Each player individually chooses one of the three combinations available to perform an action on their sheet. Multiple players can pick the same combination. Each player must write the number from the chosen combination in a house on one of the three streets on their sheet. Numbers must always be written in an empty house and must be written in ascending order from left to right. The same number can never appear twice in the same street. When filling in houses, players may leave as many empty houses between two built houses, and then fill them in later. Numbers must still be in ascending order. Also, players may skip numbers when filling in houses, like placing a 10 directly after a 7. If a player cannot follow the placement rules, they do not fill in a house number and receive a building permit refusal. Cross off the top-most, lowest-numbered space. The player's chosen combination also allows them to perform an effect. Players may perform the effect only if they did not receive a building permit refusal. Note: performing an effect is optional. Once all players have built their houses and carried out effects, a new turn begins. If the construction stacks are ever empty, reshuffle them and deal out as before. Allows the player to build a fence between two houses on the same street. To build a fence, choose any available, white-dotted space and draw a line on it. Permanent fences are present on both sides of each street. Fences determine the boundaries of housing estates. A completed housing estate is a row of 1 to 6 neighboring houses, all numbered (no blank spaces between them) and built between two fences. Completed housing estates are necessary to fulfill City Plans and may be split further, as long as they have not previously fulfilled a City Plan). Example: The architect has written a 5 on the third house of the second street in order to start a 3-house estate. Then they built a fence between the first and the second house of the first street, therefore splitting a 3-House estate into 1-house and 2-house estates. Promotes and increases the value of completed housing estates. To use the Real Estate Agent, choose a Real Estate column and cross off the top-most, lowest- numbered space. At the end of the game, each completed estate (size 2, 3, 4, etc..). scores as many points as the smallest, unchecked number from its corresponding column. Example: After crossing off the top-most space in the 2-House estate column, each 2-house estate now scores 3 points at game end. The 3- and 4-house estates score points equal to their initial amount. Allows the player to build a park. The player crosses off one of the trees at the end of the street. Parks must be crossed off on the same street that the house number is written. Parks are crossed off, left- to-right in ascending order. Allows a player to score points when building houses that have a planned pool. If a player writes the house number associated with the Pool Manufacturer effect in a house with a planned pool, then the pool is built. Cross off the top-most, lowest-numbered space in their pools column. Note: A player can use a house number/effect combination without a Pool Manufacturer effect to write a number in a house. Oppositely, a player can write a number associated with the Pool Manufacturer effect in a house without a pool. However, in both cases, the pool is not built; therefore the player does not cross off a new pool in their pools column. Agency boxes scores 7 points. The next highest scores 4 points, and the third highest scores 1 point. In case of a tie, players score the same amount of points. Example: Using a number 8 card, build a house with the number 6, 7, 8, 9, or 10. Then, cross off one box. Allows the player to duplicate a house number on any street. The new house must be directly adjacent, to the left or right of the house with the same number. Duplicate houses can never be separated by fences. 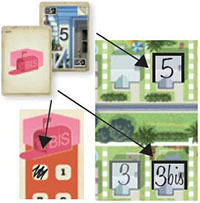 When duplicating a number, write "bis" next to the number in the new house. A house can be duplicated multiple times, and the duplicated number does not have to be associated with the number/effect combination. Cross off the top-most, lowest-numbered space in the "bis" column. At the end of the game, subtract the smallest, unchecked number from the final score. A City Plan presents a goal set by the City to its architects, as in building a certain number of housing estates with mandated sizes. The first player(s) who meet the required conditions of a City Plan during the same turn immediately score the points indicated. Write the higher amount from the "Project" side of the City Plan card in the corresponding box (n°1, 2, or 3) in their Plans column. Turn over the City Plan to its "Approved" side. A player can only score each City Plan once. Other players who later achieve the same City Plan score the lower point amount. 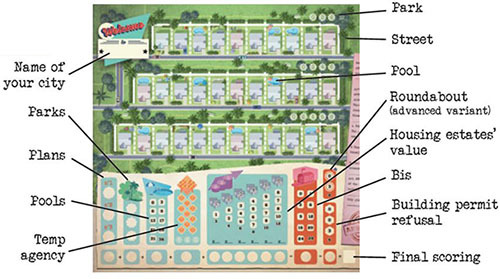 To fulfill these City Plans, the player must complete all of the required housing estates. The estates do not have to be in the same street. There is no restriction to the location of a Plan's estates. Note: After an estate has fulfilled a City Plan, it cannot be further subdivided with a Surveyor's fence. Also, it cannot fulfill another City Plan. 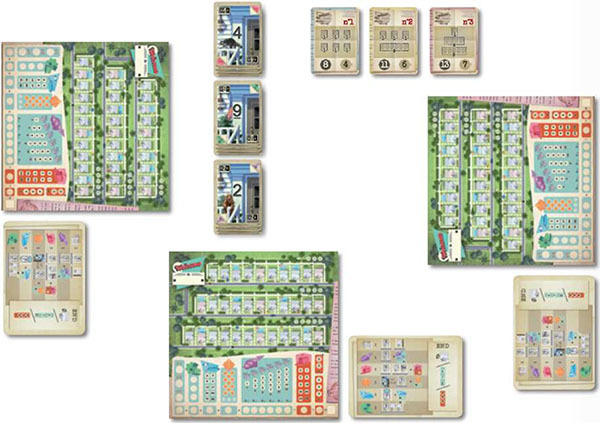 The player marks out the fence above each house to indicate it has already fulfilled a City Plan. Add up the points for City Plans, parks on each street, pools, temps, and completed estates Subtract the points from the "Bis" column and the Building Permit Refusal column. In case of a tie, the player with the most completed estates wins. In case of another tie, the player with the most 1-house estates wins, then 2-house, etc... In case of another tie, (seriously?) players play another game of Welcome To.